New Zealand recorded their first test win against Australia after 26 years in a nail-biting seven run victory. New Zealand bowler Doug Bracewell was the key man, as usual captain Daniel Vettori pulled out of the second test match. 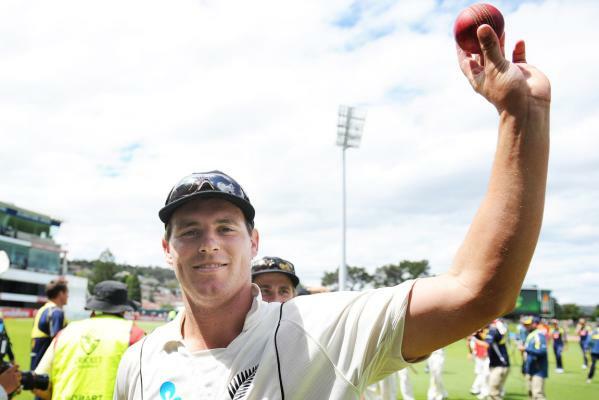 Bracewell claimed three Australian wickets in the first inning, followed by an outstanding six wickets in the second. New Zealand, who batted first, made a less than impressive total of 150, but then to the surprise of the Hobart crowd, the Australians were dismissed for just 136 runs. In the second innings, New Zealand batted a little more sensibly, putting up a total of 226. Australia facing just a target of 241 were brilliantly bowled out for 233, even though David Warner remained unbeaten on his maiden test century. Bracewell’s six wickets sparked a New Zealand comeback, however David Warner and number 11 batsmen Nathan Lyon put together a well fought 34 run partnership before Bracewell sealed the match with the wicket of Lyon. New Zealand’s victory gave them a 1-1 draw in the two match test series, with Australia comfortably winning the first test in Brisbane by nine wickets. This entry was posted in Uncategorized and tagged 26 years, Australia, David Warner, Doug Bracewell, New Zealand, Ross Taylor. Bookmark the permalink.